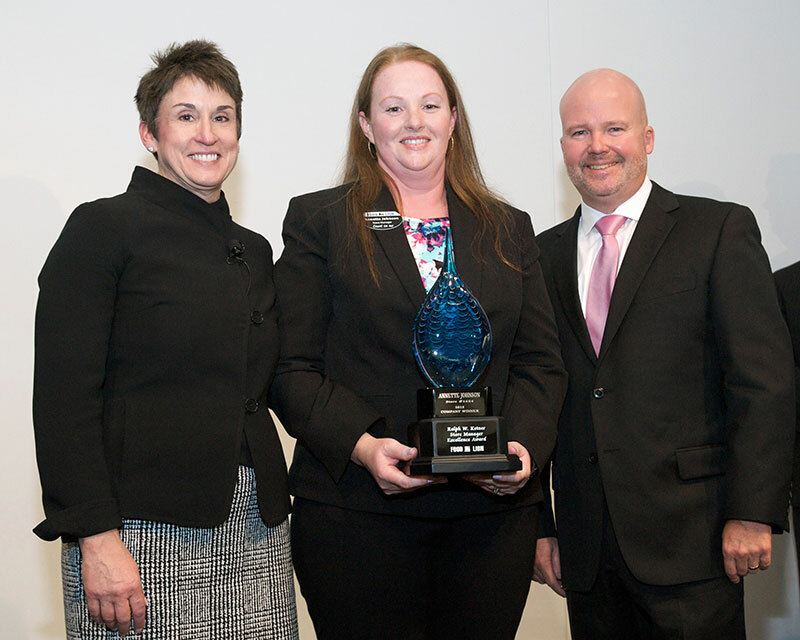 Annette Johnson, 2018 Food Lion Store Manager of the Year (center) with Meg Ham, president, and Greg Finchum, EVP-retail services. In recognition of her commitment to her community and the leadership she has shown for her team of associates, Annette Johnson was named Food Lion’s Ralph W. Ketner Store Manager of the Year on Feb. 7 at the company’s headquarters in Salisbury, North Carolina. Johnson is the store manager at the Food Lion located at 5242 Fairfield Shopping Centre in Virginia Beach, Virginia. Johnson was selected from a group of more than 1,000 store managers across the company. She and three other Food Lion store managers from Radford, Virginia, Oak Island, North Carolina, and Harrisburg, North Carolina, were the divisional winners representing their different geographic regions. Johnson has been a Food Lion associate for 25 years, the last 14 as a store manager. Johnson began her career with Food Lion as a cashier followed by various customer service positions before being named store manager. In addition to Johnson being selected as Food Lion’s Store Manager of the Year, three other store managers were recognized for exceptional leadership. • Terry Smith, store manager at 4226 NC-49, Harrisburg, North Carolina. Food Lion’s Ralph W. Ketner Store Manager Excellence Awards recognize and honor “exceptional store managers who enrich the lives of Food Lion’s customers, associates and the communities we serve, successfully lead our business and support and inspire others,” the company says. Operating since 1957, Food Lion has more than 1,000 stores in 10 Southeastern and Mid-Atlantic states and employs more than 63,000 associates. Through Food Lion Feeds, the company has committed to provide 500 million meals to people and families in need by the end of 2020. Food Lion is a company of Ahold Delhaize USA, the U.S. division of Zaandam-based Royal Ahold Delhaize Group.